The Lake Placid-North Elba Historical Society is pleased to announce the 2017 Winter Lecture Series. 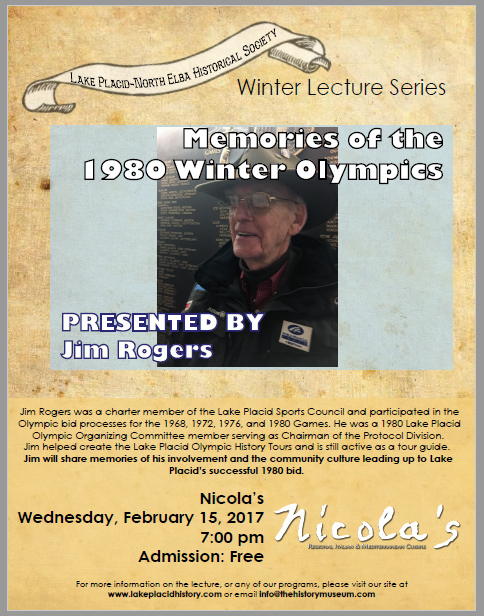 “Memories of the 1980 Winter Olympics” will be presented by Jim Rogers on Wednesday, February 15, 2017 at Nicola’s on Main. The lecture will begin at 7:00 pm with attendees encouraged to come for dinner prior to the event. Jim Rogers is a fifth generation Adirondack resident. He moved to Lake Placid in 1961, starting the local radio station WIRD. Since then, he has been an integral part of promoting sport and competition in the community. He was a charter member of the Lake Placid Sports Council and participated in the Olympic bid processes for the 1968, 1972, 1976 and 1980 Games. He was a 1980 Lake Placid Olympic Organizing Committee member serving as Chairman of the Protocol Division. Jim helped create the Lake Placid Olympic History Tours and is still active as a tour guide. He will be sharing memories of his involvement and the community culture leading up to Lake Placid’s successful 1980 bid.